In 2013, Bogor Agricultural University (IPB) officially recognized Marine Sciences as one of three focus areas in the university`s strategic plan for future research development. While in the years before marine research had been considered part of Agricultural Science at IPB, the importance of marine biodiversity for the Indonesian people and for the IPB scientific vision has now been underlined by officially including this field of research in the IPB statutes (66/2013) as signed by presidential decree. In response to this the EMBRIO Initiative was launched by Prof. Anas M. Fauzi, Vice Rector for Research & Collaboration of the Bogor Agricultural University (IPB). 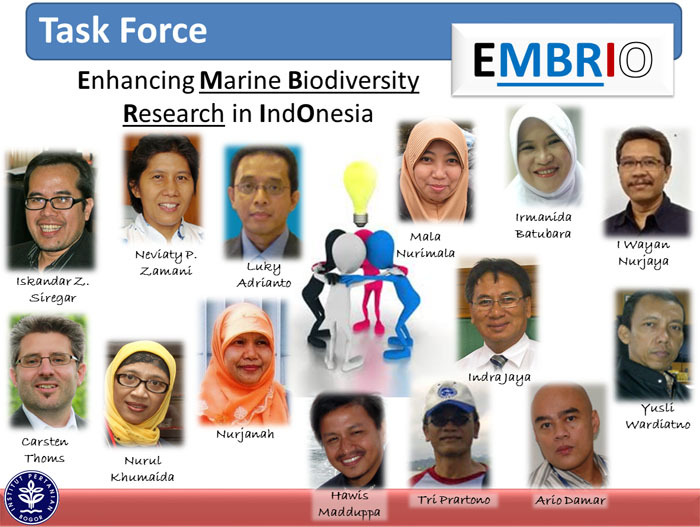 The coordination of the EMBRIO Network has been taken over by the IPB Faculty of Fisheries & Marine Sciences that also hosts the EMBRIO Management Office. However, EMBRIO aims to become a network that spans the entire Indonesian archipelago and is limited to a single Indonesian university. This, for instance, was demonstrated by the EMBRIO Constituting Workshop held in March 2013 that involved about 100 representatives from Indonesian Ministries, Governmental Agencies and Non-Governmental Organizations as well as from the Indonesian Institute of Science (LIPI) and several Indonesian universities active in Marine Biodiversity Research. Jointly, a roadmap for EMBRIO was developed at this event. While for organizational reasons at present official positions in EMBRIO are predominantly held by IPB members, it is envisaged that in the future more and more decision-makers also from other Indonesian institutions, organizations, and governmental agencies will get involved in the advancement of the EMBRIO Network.